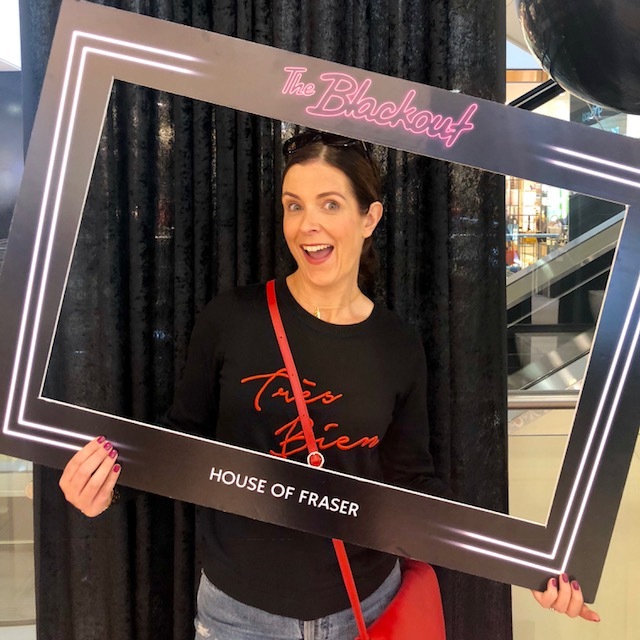 I was invited into House of Fraser yesterday to do some instagram stories about their Blackout event happening this weekend. Basically. there are tons of savings across almost every brand with extra discounts after dark and on certain 'Spotlight' products. To thank me for coming in, I was given a £100 voucher to spend on something that was reduced in the blackout and after lots of trying on (the Instastory was pretty epic! ), I opted for what some people thought was the boring option - this black Biba maxi dress. But there was rhyme to my reason because I think this dress is an amazing buy. It basically ticks the wedding/funeral/night out/school run dress criteria that I always rank my frocks on. Because if I would happily wear a dress to all 4, it's going to be a wardrobe winner. Though being honest if I had a wedding to go to, I'd probably use that as an excuse to buy something more colourful....but see for the afters of a wedding? I'd definitely wear this one. 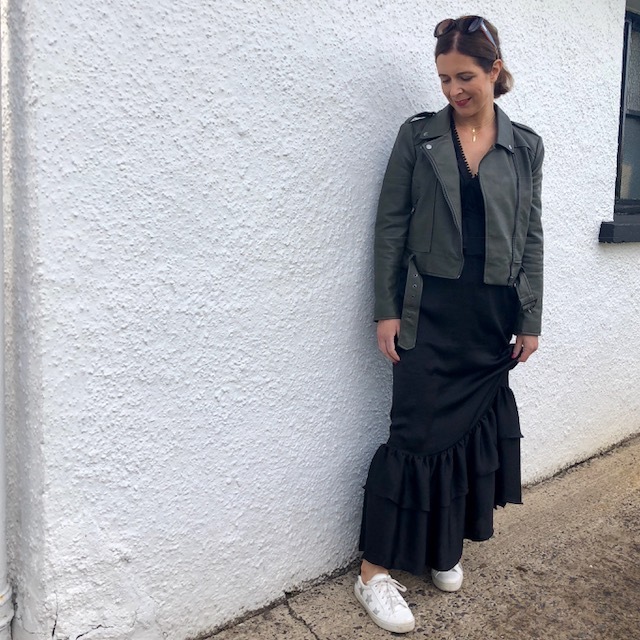 So to demonstrate.....here's one of my casual looks, teaming it with trainers and a coloured biker from Great Plains, both past season wardrobe favourites. and the instagram must have slider of the season - the Dune London Loupe. It's apparently a designer dupe but I couldn't comment....only to say that I am hoping the exorbitant price is to ensure they have a reserve for the legal challenge. I tried on both pairs in the image above but opted for the tan after seeing them EVERYWHERE on social media. 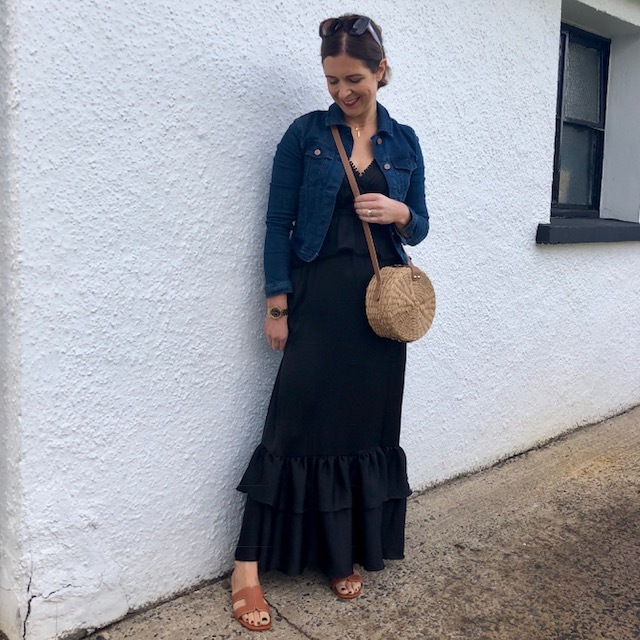 But only because they are beautifully made, super comfortable and a beautiful classic sandal that I think I will wear loads for several summers. They are sold out online but Belfast had a delivery this week so all sizes were in stock when I was in today. 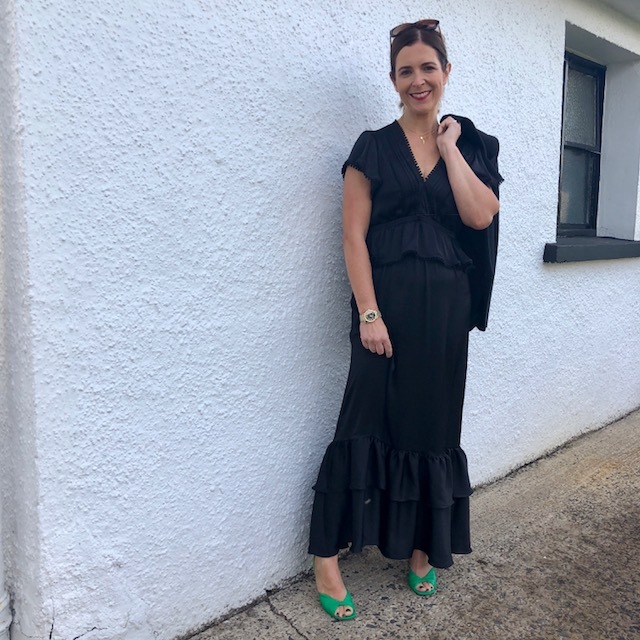 Finishing with a dressier option, using the green Topshop sandals I got last week and a longer line blazer. I actually prefer the dress without a jacket though as it's got the most beautiful pom pom detailing on the arms and it's a very flattering cut. I thought the peplum detail at the waist would be a bad idea for my pear shape but actually it's lovely. 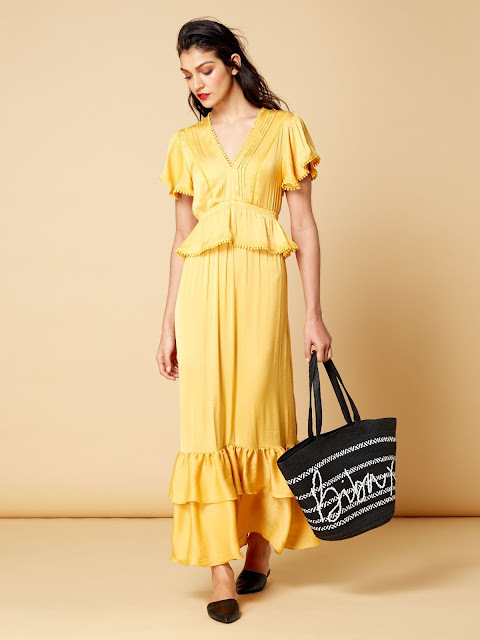 I would have tried this brighter colour only I have managed to buy a preloved yellow M&S instagram famous dress from last year. It's not arrived yet but I'm excited to give it a go a year on - when it's not quite as ubiquitous on social media. Specifically, if you're in Belfast, there will be loads going on this weekend including pop ups from Floral Earth and Lusso Tan and face-painting, glitter tattoos and balloon modelling for the kids. Oh and a prosecco bar...need I say more??! !